00:05:00 Makes 1 serving, one wrap (121 g). Makes 1 serving, one wrap (121 g). 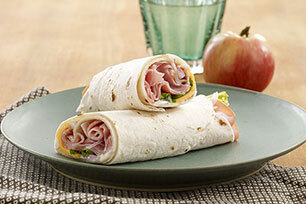 Reinvent everyone's favourite ham and cheese sandwich with a delicious wrap. Spread tortilla with Miracle Whip. Want to add some colour and crunch to the sandwich? Add one or more of the following to the sandwich wrap: tomato slices, chopped green or red peppers, thinly sliced red onions. Serve with a medium apple and an 8-oz. glass of fat free milk. Serving Size Makes 1 serving, one wrap (121 g).